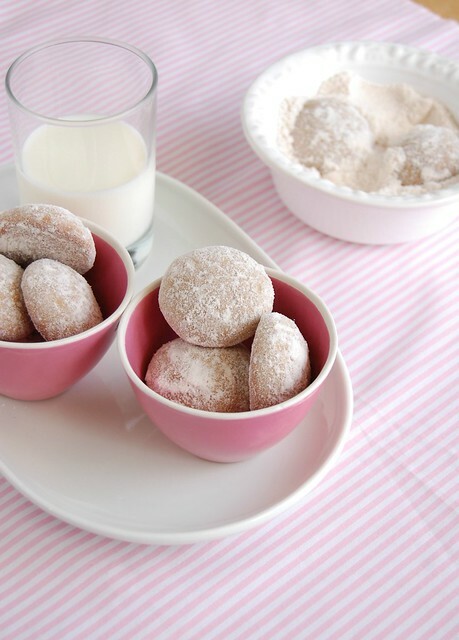 In a small bowl, mix together the confectioners’ sugar and cinnamon. Set aside. Make the cookies: in a medium bowl, whisk together the flour, ginger, cinnamon, allspice, cloves, nutmeg, baking soda and salt. in the large bowl of an electric mixer combine the butter, brown sugar and corn syrup and beat in medium speed for 2 minutes or until creamy. Add the egg and vanilla and beat to combine. In low speed, add the dry ingredients at once and beat until just combined – you might want to finish mixing by hand; the dough was too soft, so I added 1 ½ tablespoons of flour. Roll 1 leveled tablespoon of dough into balls and place onto the prepared sheets, 5cm (2in) apart. Bake until lightly golden on the edges, about 10 minutes. Remove from the oven and cool on the sheets over a wire rack for 10 minutes. Toss the cookies in the cinnamon sugar mixture to coat then set on the rack to cool completely. A brown sugar cookie is my kind of cookie - I'd like to be eating one now with my afternoon coffee! Goes well with tea or my favorite espresso. I am loving the mix of spices in this recipe. Thanks for sharing! I am totally making these. They're so cute. My husband loves anything with spice. I might have to make these today! These LOOK FABULOUS!!!! I adore Donna Hay, she has the coolest stuff!